The big earthquake in Canterbury last weekend has certainly reminded us just how shaky our isles are, in dramatic fashion. While our thoughts are with all of those affected, and we are all grateful that there has been no loss of life, the quake has exposed — very graphically — just how buildings react to a big shake. For many years the bracing and structural requirements for buildings in New Zealand have been increasing. As new research is carried out, so the values that our buildings need to meet have increased. Our scientists have also created world leading developments. (I was going to say ground breaking developments, but that isn’t quite appropriate at the moment). Dr Bill Robinson created the base isolators used on many important buildings both here and overseas, as an example. However, the location of this quake has certainly surprised many scientists. Certainly the current NZ Standard for light timber framed construction (NZS 3604) that is most often used for building houses, shows that Christchurch is a medium earthquake zone, while Lyttleton and Timaru are in a low earthquake zone. 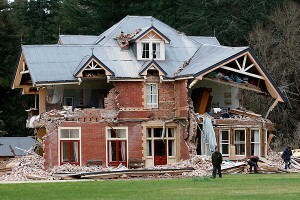 I suspect that the current review of NZS 3604 will be reviewed again as the results of this quake are analysed. Obviously it is far too early to draw conclusions as to the technical details of what has happened, however initial observations from the photos and news reports show that there are some things you can plan for, and others you can’t. It is pleasing to see that many of the buildings that have been earthquake strengthened have survived mostly intact. You are never 100% sure how well any remedial work will perform. Now that it has worked it is a pleasing result. Plus any failures will add to the knowledge base on what needs to be done better next time. As would be expected, the buildings with the greatest damage are those built using un-reinforced double or triple skin brick construction, or even solid stone construction. This is a common form of construction in England, however it is not such a good idea in shaky NZ. Unfortunately many of these buildings were also regarded as some of our historic heritage, and now they are lost forever. While a great many buildings have survived with minimal damage, the things you can’t plan for are where a fault ruptures the ground directly under your building, or (to some extent) where liquefaction turns the ground to quicksand. While most buildings have coped with the ground shaking (to greater or lesser degrees), it is where the ground has moved differentially and permanently that has torn some places apart. You can see where the ground has moved sideways. It has opened up in a crack or heaved up in a mound. What were straight fences now have a 2 metre offset. And so, it is that sort of an offset, when it opens directly under you that is catastrophic for any building. Science does not know where these will appear and there is no way to plan or avoid this sort of action. Liquefaction on the other hand has had a lot of research done into how it happens, and the types of soils that are susceptible to it. The images of buildings having subsided with large areas of sand around them, and residents reports of water gushing up from the ground all indicate that this was the likely cause of the damage. There are known techniques for reducing the likelihood of a building sinking in such an event, however relating the known science to a specific piece of ground is not as exact as many would like. For example it is suspected that because much of the Hutt Valley (in Wellington) is on old river planes, these areas will liquefy in a big shake. Many buildings therefore have piles extending down through the river gravels and onto hard rock. However, what isn’t fully known is how big a shake it will take for the ground to liquefy, to what extent it will happen, what the exact areas of soil that will liquefy are, or what extent of structural work is required to mitigate the effects. Again, it would appear that because Christchurch was not previously assessed as a high earthquake risk, then some areas that were built on were not expected to liquefy as they have. As the clear up and the rebuilding begins, look for numerous reports in coming months as the scientists describe what has happened, and the engineers look for ways to counteract the awesome forces created by moving ground. This was the blog of Ken Collins, who designs scientific laboratories. It has been archived but the posts remain for your reading pleasure.